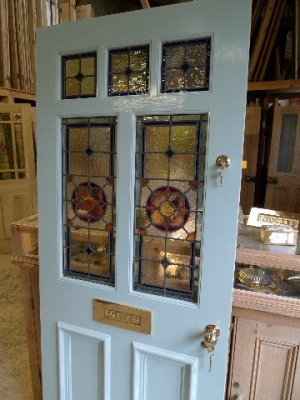 supply Antique and reproduction stained glass doors throughout the UK from Brighton in the south, Birmingham in the midlands, to as far north as Glasgow and Edinburgh. We can also provide a fitting service covering London, Kent, Guildford, in Surrey, Winchester, Southampton and Sussex. 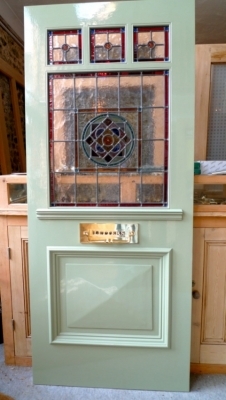 We are proud to offer our range of solid pitch pine internal doors and our Engineered oak stained glass external front doors . 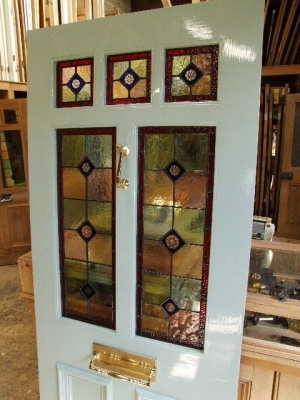 We believe our reproduction stained glass and glazed, reclaimed and salvaged Victorian, Edwardian, Georgian and 1920s / 1930s interior and exterior glazed doors are the best you will find for sale anywhere in the UK. 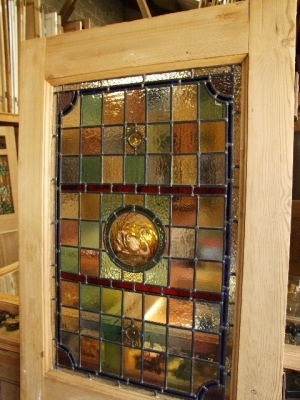 The stained glass door panels are made using traditional methods. 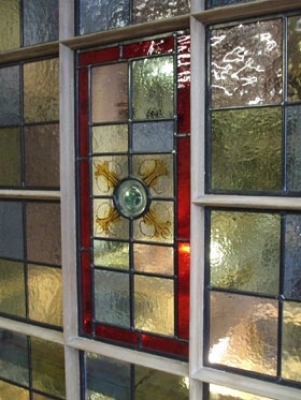 We use hand floated glass that includes all the irregularities natural flaws fissures and bubbles of antique Victorian glass. We also include hand spun rondels and brilliant cut glass made using the same methods as Victorian glass makers. 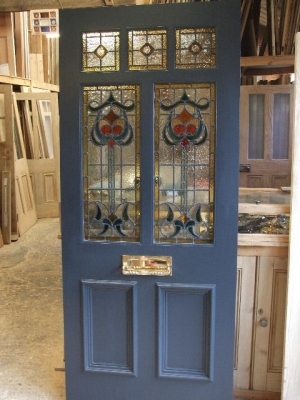 We have reproduced various period antique reclaimed Victorian stained glass front doors incorporating the Victorian sense of proportion, such as the wide mid, bottom and side rails, lacking in mass produced tropical hardwood doors. 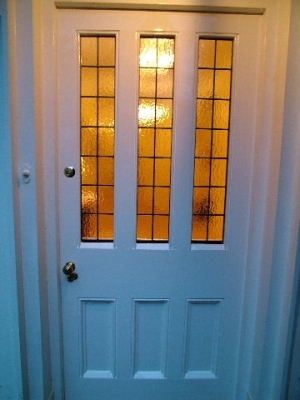 Our internal and external doors are made in the traditional way using strong mortise and tenon joints. Our internal pitch pine doors are made from solid pitch pine . Pitch pine is an excellent timber and has been used in shipbuilding for centuries , notably on the hulls of Scottish fishing boats. They can be painted or may be oiled for a more contemporary look complete with chrome fittings. 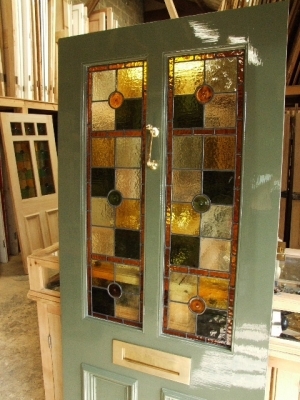 In addition to our reproduction doors, we have a varied stock of reclaimed Victorian, Edwardian, Georgian, 1920s and 1930s style stained glass doors and stripped pine internal and external antique doors. 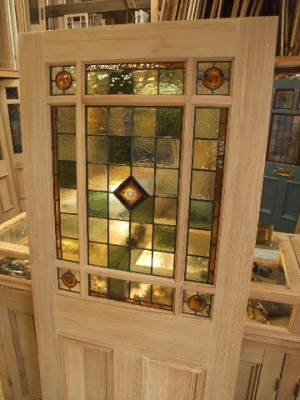 Visitors are most welcome to visit our showroom which is located midway between Alton and Petersfield in Hampshire to view our stained glass doors. Please feel free to email for further information. Visitors to our showroom are most welcome on Saturdays by appointment from 10:30am - 2:30pm on the 1st Saturday of the Month.